Looking for an easy, fun recipe to make this Halloween? 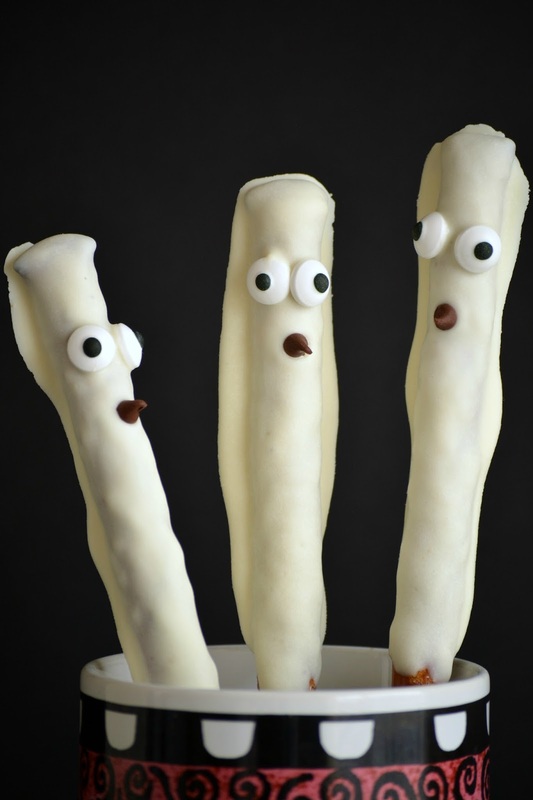 Then these ghost pretzels are the perfect snack for you to make because all you have to do is melt the white chocolate, cover the pretzels with the chocolate and then let them dry before serving. I personally don’t like crispy pretzels that much. Every time they give me a small bag of pretzels during a flight I just stare at it for a while, and then end up eating it because I feel like I already paid way too much money for my plane ticket, so I might as well eat whatever “free” snack they give me. Pathetic, I know. However, I do like eating sweet pretzels like these because I love the sweet and salty combination of the chocolate with the pretzels. And the best part is that you don’t have to make them look like ghosts. If you want, you can just cover them with chocolate or even Candy Melts to serve them on any other day of the year. Place the white chocolate chips in a bowl and melt them in the microwave for about 1 minute. Repeat this process in 20 second intervals until all the chocolate is melted. 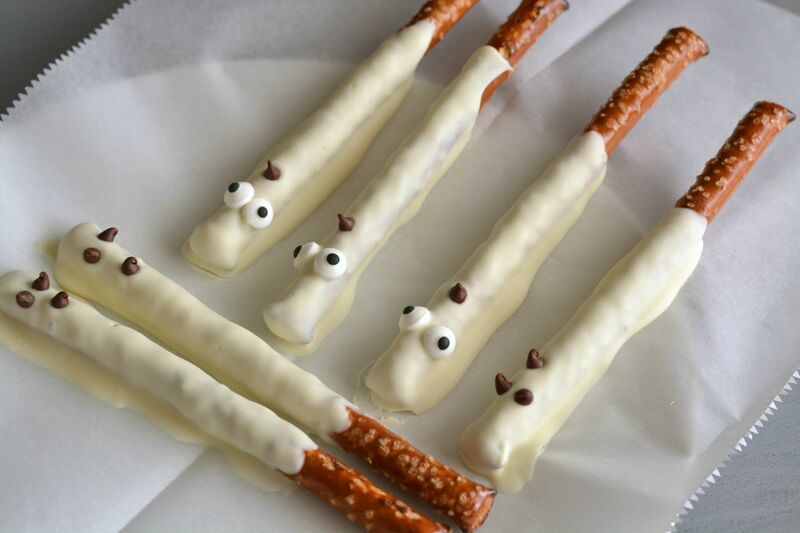 Cover the pretzel rods with the melted white chocolate leaving about 3 inches (7.5 cm) at one of the ends for holding. Hold them upside down to let the extra white chocolate drip off as much as possible and place them on parchment paper. Immediately place two candy eyeballs for the eyes and one mini milk chocolate chip for the mouth. If you don't have candy eyeballs, you can use two mini chocolate chips for the eyes. You can also melt regular milk chocolate chips to make the eyes and the mouth. Let them dry completely before serving.